Donald Trump isn't giving up on his months-long tirade against Amazon, Jeff Bezos and the Washington Post. Trump went on Fox News Thursday night to tell Sean Hannity the same theory he's been spouting since he went on an epic Twitter tirade against Bezos in December. Trump's contention can basically be boiled down to this: Bezos bought the Washington Post in 2013 in order to persuade Washington politicians to keep Amazon's taxes low and help the company avoid antitrust scrutiny. And Trump says that since he would be tougher on Amazon than Hillary Clinton, Bezos is also using the Post to write nasty articles about Trump to keep him out of the White House. "This is owned as a toy by Jeff Bezos who controls Amazon," Trump told Hannity. "Amazon is getting away with murder tax-wise. He's using the Washington Post for power so that the politicians in Washington don't tax Amazon like they should be taxed." Trump said Bezos is "worried about me," because "he thinks I would go after him for antitrust because he's got a huge antitrust problem. Amazon is controlling so much of what they're doing ... What he's got is a monopoly and he wants to make sure I don't get in." In a statement, Washington Post editor Marty Baron denied Trump's charges. "As the individual who oversees The Washington Post's news staff, I can say categorically that I have received no instructions from Jeff Bezos regarding our coverage of the presidential campaign -- or, for that matter, any other subject," Baron said. "The Post has a long tradition of publishing thorough examinations of the major party nominees for president." A spokesman for Amazon (AMZN) declined to comment. The problem with Trump's argument is that it's a tinfoil hat conspiracy theory that isn't backed up by the facts. It's clear that the Washington Post has written many negative articles about Trump, and the newspaper's dislike for Trump is well known. But connecting the dots to Amazon, which the billionaire Bezos also owns, doesn't make sense. Amazon paid $273 million cash in income taxes last year, up from $177 million the year before and $169 million in 2013, according to its latest annual report. That's actually pretty impressive, considering it made just under $600 million in profit in 2015. It had a $241 million loss in 2014 and a $274 million profit in 2013. There are companies with far bigger profits, like GM (GM) and United (UAL), that pay zero U.S. income taxes. 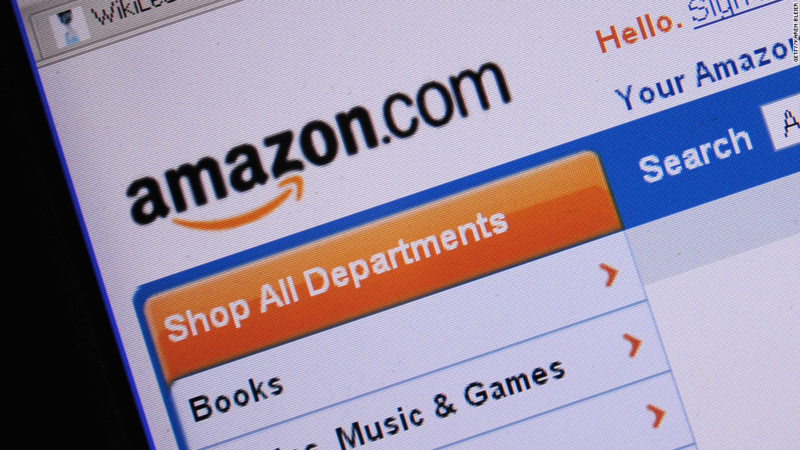 Amazon has come under attack for not collecting sales tax in the past. But the federal government doesn't collect sales taxes. There are 28 states that have passed laws requiring Amazon to collect sales tax, but Washington politicians supposedly influenced by the Post have nothing to do with those laws. The company has also faced scrutiny in Europe for underpaying its taxes. Its U.K. business paid just under £12 million last year, and the European Commission continues to investigate Amazon for its tax deals with Luxembourg, which may have helped Amazon underpay its taxes there for a decade. It's also unclear that the government would have a solid antitrust case against Amazon. According to the Sherman Antitrust Act, a judge would need to find that Amazon is a monopoly that abuses its power and harms consumers as a result. That's a high bar. Amazon is hardly the largest retailer. Its sales are about a fifth of Walmart's (WMT). It's true that Amazon has had a huge, sometimes disastrous impact on brick and mortar retailers. But even if federal prosecutors could convince a judge that Amazon were a monopoly, it could be tough to argue that consumers haven't benefited from Amazon's lower prices. Still, if Bezos thinks Trump would be bad for Amazon, there's good reason for that. In February, when Chris Christie gave Trump his endorsement at a campaign rally in Fort Worth, Texas, Trump made a stump speech in which he threatened Bezos and Amazon. "I have respect for Jeff Bezos, but he bought the Washington Post to have political influence," Trump said. "He owns Amazon. He wants political influence so Amazon will benefit from it. That's not right. And believe me, if I become president, oh do they have problems. They're going to have such problems." Trump's accusations began six months ago. Two days after the editorial board of the Post called Trump a "poison pill" for the Republican party, Trump lashed out in a tweetstorm. He called Amazon a "big tax shelter," and Bezos' ownership of the Washington Post a "scam." Bezos, who Forbes says is worth $62.4 billion, responded by offering to send Trump, worth $4.5 billion, into space on one of his Blue Origin rockets.